Gannabos bed and breakfast is a stylishly furnished cottage, ideal for honeymoon couples, a romantic getaway or just a stay over when traveling long distances. Feather duvets, cotton linen, and soft luxurious towels are provided to enrich your stay. It offers you guaranteed peacefulness and a well deserved break. 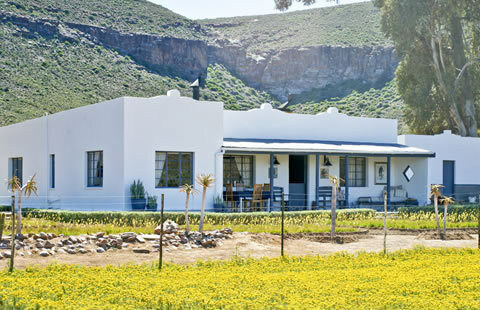 The cottage is situated on the farm Gannabos, well known to photographers and nature lovers. The owners, Merwe and Nakkie van Wyk, are proud to share the beauty of their surroundings with you. Also to be found are some of the local residents and the actual boss, a toy pom named Goliath. A quick peek at the inside of the cottage shows you the stylish double cast iron bed. Every morning you can wake up to a delicious Hantam breakfast you can prepare yourself in the privacy of the cottage. You do not need to do any dishes here, it is one of the many perks of visiting Gannabos. The private, one bedroom cottage or ‘rondawel’ has an en-suite bathroom with a shower. All kitchen utilities such as plates, glasses and cutlery are provided. Outside is a braai area, set up with a table and chairs to enjoy a Karoo sunset. You will be provided with wood, firelighters, a grill and braai tools. Every afternoon a freshly baked bread will be provided for your enjoyment. Homemade farm produce such as rusks, a variety of jams and preserved products such as quinces and green figs as well as photo prints of Nakkie van Wyk are available to purchase. Next to the cottage is a swimming pool for those hot summer days. 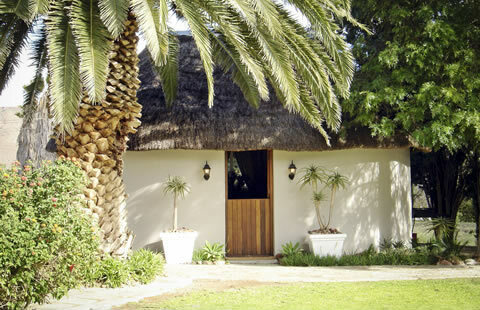 Enjoy panoramic views of the surrounding landscape from the pool in the tranquil garden, while having a peaceful braai. Next to the cottage is a huge palm tree that is covered with finch nests from August onwards and a shrub that is filled with butterflies. This natural phenomenon is spectacular to experience and a great opportunity for the keen bird watcher or photographers alike. In the evenings, some furry locals might show up to make you feel extra welcome. Gannabos is a full functioning working farm. Beautiful things can be expected on your visit here. During the winter months you will be able to taste the sweetest oranges cultivated on the farm itself.